The schools sensory room is located within the primary department and is available for all pupils in the school to access. The room is designed to create a stimulating and yet calming atmosphere. In addition to this room, some class rooms have their own Sensory Room. 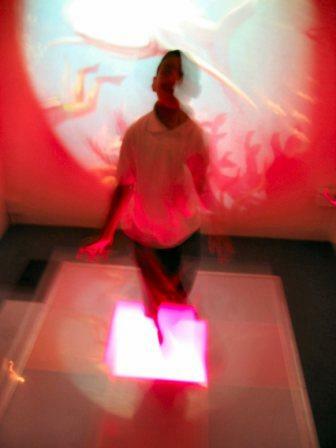 The Sensory Room is divided into different areas which include: a soft play area, dark room, and sound room. Within the room there is a range of equipment including light projectors, bubble tubes, mirror balls, fibre optic sprays, tactile boards, a water bed, fans and UV walls. All of the equipment is designed to provide visual, auditory, tactile, kinaesthetic and olfactory stimulation. The rooms are used for both therapy and education; some of the benefits can include; increased concentration and focused attention; cognitive development by increased brain function; social interactions; or providing relief from pain and painful physiotherapy. The Interactive Studio is located in the 6th Form and is available for all pupils in the school. The studio is an audio-visual interactive lighting system activated by gesture, movement and touch. The environment can be transformed with mood lighting, floor projections, wall visuals and music. Different visuals and sound effects can be tailored to the suite to cater for each Key Stages curriculum themes or to celebrate world festivals and holidays. Pupils can attend the studio in class groups or individually. Sessions in the studio may involve: storytelling, Cause and Effect understanding or music composition, to name a few. Benefits of the studio may include; heightened awareness and improved alertness, exploration of environment, improved co-ordination and motor control, cognitive development, and improved opportunity for choice and self-determination. The studio is an adaptive piece of equipment that can support all subjects and themes.